Tell us a bit about your show title, "Fly Traps," and how that came about. Insects have featured significantly in my work, and while they are mostly butterflies and flowers in these pieces, I also use the female form, so I was playing with the idea of "Venus" (Roman goddess of beauty and lovely) fly trap. I was also playing with the siren's song of beauty or wealth and thinking one can control these things that ultimately fade away as a trap. Your work in the past has considered the impermanence of life and it’s experiences- are these concepts still driving your creative process today? Definitely. I've been using a lot of cut up flowers lately and thinking about the idea of "sentient death" and are they still "alive" after they are cut. They're more of a metaphor for beauty and youth and ultimately life slowly changing and fading. I love the details and textural quality of your illustrations- they’re like contextualized science illustrations! Do you think the realistic qualities of your work contribute to any of the greater conversations we are having as a society today? Contextualized science illustrations is a good description. I think [the work] is more related to current issues regarding control of women’s bodies. 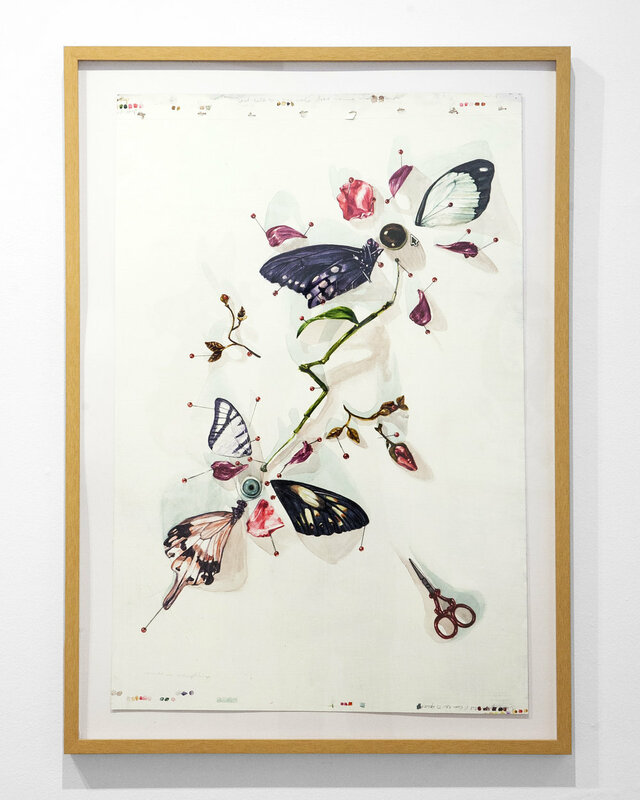 This work is all about manipulation and control of things that are already beautiful- flowers, butterflies, etc, and destroying them in a way that makes a monstrous parody of the original object. I think women feel this intense pressure to be perpetually beautiful in a fake way but we are also more connected to the earth because we give birth. I like to use predator-prey eyes to play with the idea of the male gaze and give a sense of anxiety. The agents of destruction in the work- the red embroidery scissors and red sewing pins- are meant to be quietly violent and evoke the idea of traditional women's work. I also really love ink and paper and their more feminine qualities in terms of materials. I also love the history of women in scientific illustration, Maria Sibylla Merian for example, who made a name for herself when women weren't well regarded as artists or scientists. A big thank you to Aubrey for providing such in-depth insight on her work! “Fly Traps” will be on view for the month of April; Running concurrently with Kyle Dunn’s “BUZZ,” First Amendment invites you to join us for this double opening reception Saturday April 6th, 7pm to 10pm. For more information on the artist, please contact info@firstamendmentgallery.com.